You might flee from words like “quarks,” “relativity,” and “joule,” but you shouldn’t have to, and neither should a kid. A new children’s book from the folks at a few of our national labs will hopefully make the things particle physicists are talking about easier to digest. 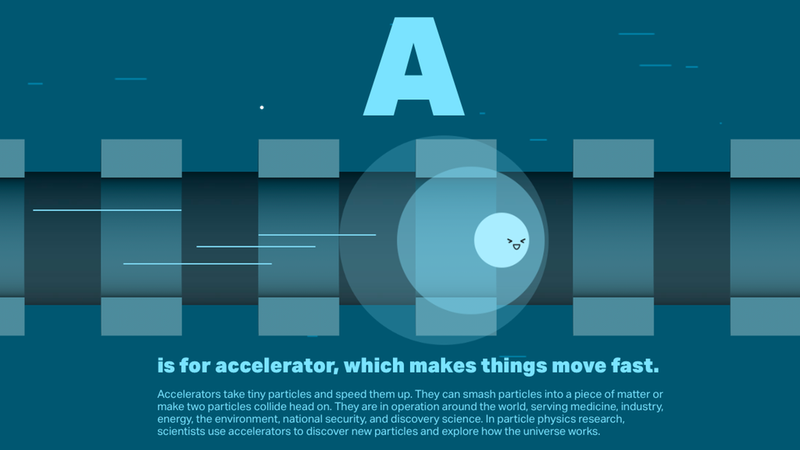 The book, titled The ABCs of Particle Physics by Lauren Biron and Chris Smith, takes a child (or maybe just an interested adult) along an adorably dorky rhyme-trip through some of the most important high-energy physics concepts. It’s available as an animated or non-animated webpage, pdf, or as a board book you can buy as a gift for every six-year-old you know. As you’re reading your kids their bedtime stories, you may finally start to understand what scientists are talking about when they mention inflation or the Higgs boson. K is for kaons, with quarks that are strange. Many subatomic particles are made of building blocks called quarks, which come in six different types. Kaons are particles that contain a quark called a strange quark. Kaons are important because scientists used them to find clues as to why our universe is made of more matter than antimatter. They discovered that kaons and their antimatter partners decay in different ways, contributing to the imbalance. But hey, the sweet drawings should at least help the dense concepts go down more easily. The ABCs of Particle Physics was published by SLAC National Accelerator Laboratory and Fermi National Accelerator Laboratory, who jointly run symmetry magazine, and the hardcover version only costs 10.99. Really, this book is for everyone.